Hello everyone, we are moving right along in this Beginners Guide to Vinyl. Now that we have learned all about setting up our machines for cutting our project, we get to learn how to load our vinyl. Last week we learned all about Vinyl Cut Settings for Silhouette CAMEO. This is a beginner level series but may have some tidbits of knowledge that are helpful for all levels of crafters! 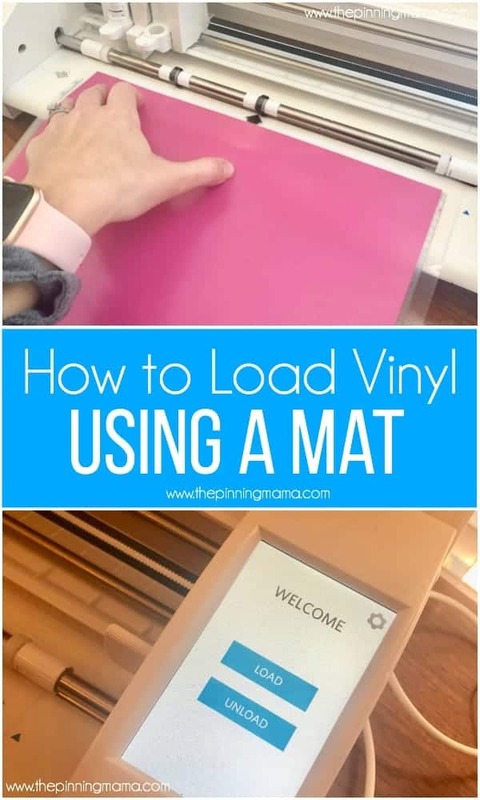 Now that you have your design all ready to cut, it’s time to load your vinyl into your machine. This can feel intimidating but once you do it, it will feel like second nature. So let’s get started! The first thing you need to do is make sure your rollers on your Silhouette CAMEO are set to the widest position. Place the vinyl on the correct size of mat you have selected in the Silhouette Software. Line the mat up with the blue line on the left hand side of your machine. Now select Load on your CAMEO 3. I like to cut most of my vinyl without a mat, because the majority of the time I am using rolls of vinyl instead of sheets. 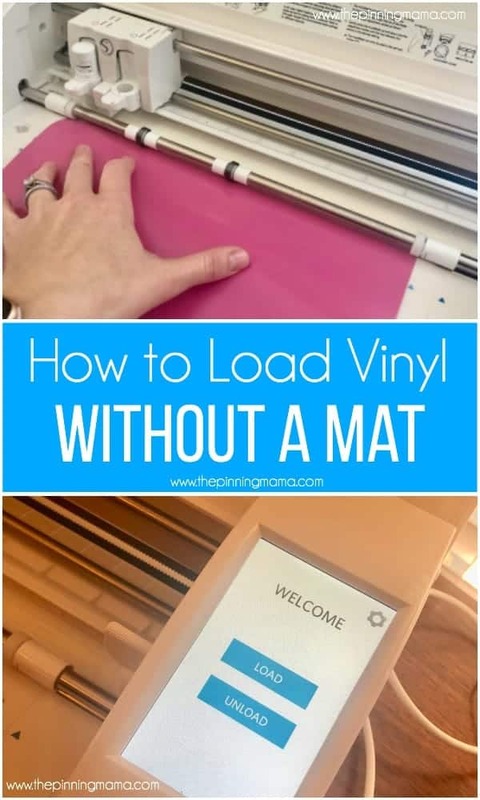 If you are using a sheet of vinyl, most often you will cut using a mat. Realign the rollers of your CAMEO so that the right side of your roller aligns with the edge of your vinyl. For 12 inch vinyl this is the next to last notch. For 9 inch vinyl you will need to move the roller in closer. Make sure that both the left and right rollers align with the vinyl perfectly. Line your vinyl up with the blue line on the left hand side of your machine. 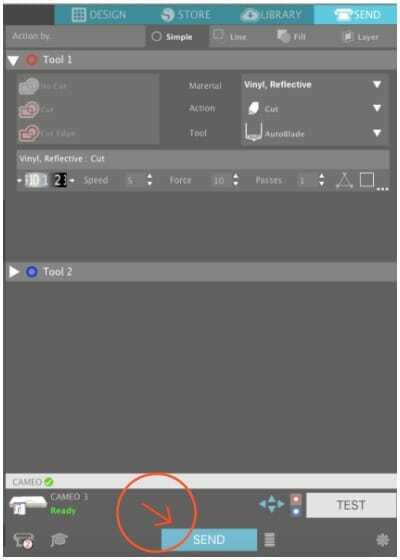 Once your material is loaded, go to the the send tab in Silhouette Studio. Make sure you have the correct vinyl selected and your cut settings are where you want them. Now you are ready to perform your Test Cut. As mentioned last week, Test Cut is located at the bottom of the send tab. Once your Test Cut is finished, press unload on your Silhouette CAMEO. If your test cut comes out clean, re-load your vinyl and Send your project to be cut on your Silhouette CAMEO. It’s that easy. If you find your vinyl shifting during the cutting process, stop the project and adjust your rollers. They are spaced too wide and can’t grip the vinyl. I have ruined many pieces of vinyl with this problem. That is all I have for you this week. I hope I answered any questions you had about loading vinyl. Tune in next week to learn all about How To Prepare Vinyl to Apply.